Although many mousse recipes require thickeners or long cooking times to set the ingredients, there are many recipes that take just a few minutes to prepare before they're ready to chill. Depending on the recipe and preparation techniques, a mousse may be light and fluffy or thick and dense, but both textures have a tendency to melt in the mouth. Mousse is a decadent dessert with a rich, thick texture and robust flavor. 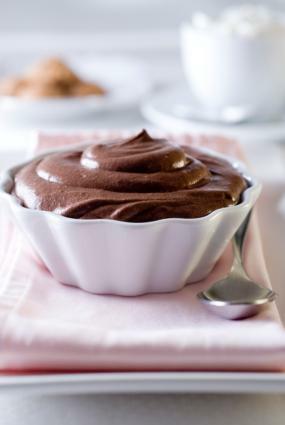 Mousse can be made simply, using dairy or dairy alternatives in recipes. Purée the mangoes with the honey in a food processor or blender until the mixture is completely smooth. Add the cream and blend again until incorporated. Chill the mousse for at least 2 hours before serving. Using a double boiler, melt chocolate, 1/4 cup of water, and butter. Meanwhile, whisk egg yolks, 1/4 cup of water, and sugar into a small saucepan. Stirring constantly, cook over medium heat until the syrup reaches a temperature of 160 degrees. Remove mixture from the heat and whisk in chocolate mixture until combined. Place pan in an ice water bath and continue to stir until the mixture thickens, about 5 to 10 minutes. Remove from ice bath and gently fold in whipped cream. Place in serving dishes, cover, and refrigerate for at least 4 hours. Break the tofu into large pieces. Put the pieces in a food processor and blend the tofu until it is completely smooth. Leave the tofu in the processor. Meanwhile, pour the maple syrup into a small pot and sprinkle the agar agar on top of it. Let the mixture sit for 10 minutes. Warm the syrup mixture on medium heat until the sugar dissolves. Allow the syrup to cool for several minutes. Pour the syrup into the food processor and blend it with the tofu until smooth and uniform. Refrigerate the mousse for at least 4 hours before serving. Begin by separating the egg whites from the yolks. Place each into separate bowls. Whisk together egg yolks, melted butter, and sugar. In a separate bowl, whisk whipping cream until it forms soft peaks. Add 2 tablespoons of sugar to cream and set aside. In another bowl, whisk egg whites until they form soft peaks, and then add 1 tablespoon of sugar. Gently fold the whipped cream to the egg yolk mixture. Fold the beaten egg whites in to the above mixture. Pour the vanilla mousse into serving bowls then refrigerate for at least 4 hours or until well chilled and set. 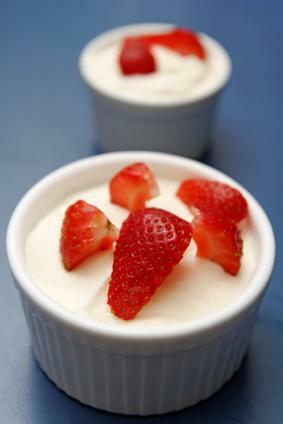 Mousse can be garnished with fresh fruit, such as blueberries or strawberries. Preparation can be tricky, so it's important to follow mousse recipes precisely and not to skimp on what may seem to be long beating times--the extensive whipping is necessary to achieve the proper consistency. Feel free to substitute or supplement extracts or flavorings. While fruit extracts are the most common, coffee, liqueur, or mint flavorings add unique tastes to a rich confection. Mousse desserts originated in France as a blend of soufflés and ice creams, and first became popular in the United States in the 1960s. 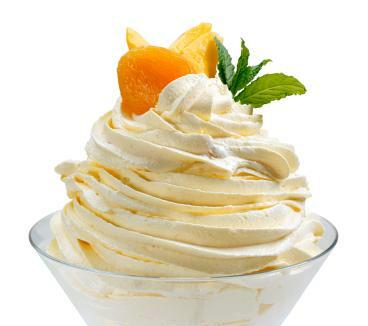 They can be served hot or cold, though cold mousse recipes are more common for desserts, and some sweet varieties are even frozen. 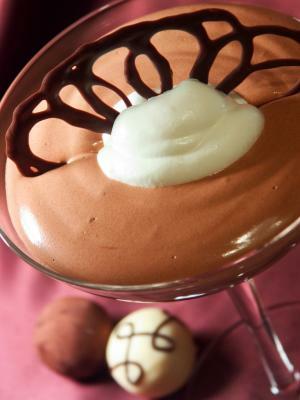 Chocolate mousse is by far the most popular, though it may be garnished in a number of ways or enhanced with fruit or mint extracts for more exotic tastes. White chocolate and fruit mousse are also popular.